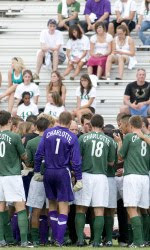 WINSTON-SALEM - Evan James netted a goal and an assist to lead the Charlotte 49ers men’s soccer team to a 3-1 upset of fourth-ranked Wake Forest on Tuesday night at Spry Stadium. The win is the first for Charlotte (5-1-2) over a Top-10 team since it beat then-No. 1-ranked South Carolina in the 1994 season. The loss snaps Wake Forest’s 46-game unbeaten streak against non-conference opponent, which was the longest active streak in the country. The Deacons’ last non-conference loss was to California in the 2005 NCAA tournament. Wake Forest (5-2-1) won the 2007 NCAA title and advanced to the semifinals of the College Cup last season before being eliminated by North Carolina. James’s goal was his fifth of the season to go with four assists. Jennings Rex and Owen Darby also scored for Charlotte. Charlotte scored on its first shot of the game, in the 11th minute. Andres Cuero played a long pass down the middle of the field that found James open and 1-on-1 with Wake goalkeeper Akira Fitzgerald. James' shot beat Fitzgerald to the right to put the 49ers up 1-0. Great job 49ers!! !Not my favorite sport but way to go! I think we are ranked?